Did racism exist in the Portuguese empire? ‘Aqui, a presença de Portugal nao significa a ausência, muito menos a morte da África…Angola, luzitanzando-se, enriquece a sua vida, a sua cultura de valores europeus que aqui, neste mundo em formação, confratanizam com valores nativos ou tropicais, sem os humiliar: a oliveira ao lado da bananeira; a uva ao lado do dem-dem; a macieira ao lado da palmeira; o branco ao lado do preto’. ‘Africans in colonial Angola were expected to assimilate an almost pure, unmitigated Portuguese culture, barely modified by the slightest trace of their own numerically dominant culture’. ‘Portugal, o Brazil, a África e a Índia portuguesa, a Madeira, os Açores e Cabo Verde constituem (…) uma unidade de sentimentos e de cultura’ . These consisted in a predisposition for miscegenation and an absence of racial prejudice, both of which had their origin in the influence of the Moors, the Jews and of Africa and had served to create the paternalistic and ‘socially plastic’ character of the Portuguese. The Portuguese was ‘the European colonizer who best succeeded in fraternizing with the so-called inferior races’ . The publication of his first book Casa Grande e Senzala in 1933 had served to overturn the consensus on race in Brazil, which held that Brazil’s lack of development was due to ‘the ”debilitating’ influence of the large black and mestiço population’ . In the late nineteenth century Brazil had imposed ethnic quotas on immigration in an attempt to guarantee the country’s ‘ethnic integrity’ . Freyre challenged these notions through detailing and celebrating the huge influence that the African and the Indian had had on Brazilian life. Many of Portugal’s most prominent colonial officials shared these racist sentiments. António Enes was ‘a forthright racist, and what he says about the African and his place in the colonies is a truism long accepted by most Portuguese colonialists’ . Mousinho de Albuquerque, Norton de Matos, Serpa Pinto and others ‘continued to propagate the notion that Africans were inherently inferior’ . Politicians in Portugal often shared these beliefs. In a speech in 1893 the MP Dantas Baracho stated the African didn’t deserve citizenship rights, as he was inherently ‘lazy, drunk and criminal’ . The notion of the African as someone who had to be made to work was very current; Mousinho de Albuquerque spoke of the Africans ‘recusando-se a toda a especie de trabalho’ . ‘(…) the inferiority of Africans could dilute or even ruin the effectiveness of Portuguese colonization if the government did not put ‘for at least a century, the greatest obstacles to the fusion of the white race with the native races of Africa.” . ‘Beginning with the intensification of anti-colonial criticism in the United Nations in 1951, Portugal began to shift the emphasis of her ‘mission’ from exaltation of the overseas settler to aggrandizement of the emergent and multiracial societies in Angola and Mozambique’ . The work of Gilberto Freyre, then, and particularly his willingness to be carefully shepherded around selected parts of Portugal’s overseas world in the same year, 1951 , would play a crucial role in Portugal’s attempts to justify its continuing possession of parts of Africa and India. In one of the books he wrote after his trip to the overseas colonies (hastily recategorised as overseas provinces, hence parts of Portugal itself) he praised the Estado Novo Government as ‘honrado, intransigentemente honesto’ . He also wrote of the ‘gosto de ver confirmado na África e no Oriente (suas) antecipações sobre a obra colonizadora dos portugueses (que) continua a ser activa e fecunda’ . 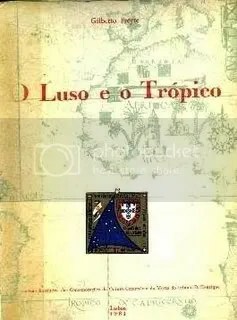 In The Portuguese in the Tropics (1961), a book specially commended by the state to commemorate 500 years since the birth of Henry the Navigator, he even talked of a new civilisation, a third species of man, created by the experience of Portuguese colonization . This new adapted form of Luso-tropicalism quickly became Portugal’s core colonial ideology. Salazar talked of the ‘primacy we have always attached to (…) the enhancement of the value and dignity of man without distinction of colour or creed’ . His eventual successor Caetano claimed that in Angola and Mozambique ‘races are blended, cultures are altered (and) efforts are united to continue and perfect a type of society in which men are only limited by their ability, their merits or their work’ . Franco Nogueira went even further in asserting boldly that ‘We alone, before anyone else, brought to Africa the notion of human rights and equality (…) it is a Portuguese invention’ . In The Portuguese and the tropics, Freyre contrasts the Portuguese colonizing mission with the attitudes of the Northern Europeans, who he accuses of regarding the non-European ‘in the same terms as wild animals’ . In South Africa these attitudes had resulted in the Apartheid system, ‘the most perfect fulfilment until now carried out of the myth of the absolute superiority of the European race’ . It is true that the Portuguese never enacted apartheid legislation of the kind experienced in South Africa. Black people were not restricted to townships, mixed marriage was permitted and the children of mixed unions were recognised throughout the Portuguese colonies. However, as Bender writes, ‘The absence of racist laws or separate racial facilities is clearly not indicative of the absence of racial segregation’ . There are a number of areas in which it might be useful to consider just how valid is Freyre’s implication that apartheid would have been untenable in Portuguese Africa. Charles Boxer demonstrates that Portuguese policies with regard to race relations differed considerably according to circumstances of time and place. The Portuguese state was not an automatic promoter of mixed marriages. A royal decree of 4 April 1755, for example, prohibited mixed marriages ‘com mulheres índias ou seus descendentes’ . This contrasted sharply with earlier royal encouragement of mixed unions between Portuguese settlers and indigenous women in order to populate Brazil. Such unions, as Gilberto Freyre shows, created a profoundly mixed society in Brazil. A similar level of miscegenation was seen in Cape Verde. However, this was certainly not the case in the other Portuguese colonies. The mestiço population of Mozambique in 1960 stood at 0.48%, and that of Angola merely 1.10%. Ironically, the figure for South Africa, where mixed marriages were prohibited by law and the children of mixed unions were not recognised, stood at around 10%. Contrary to Freyre’s assumptions, Brazil was not representative of the majority of Portuguese colonies in terms of miscegenation . One reason for the low levels of assimilation, alongside the virtual impossibility of attaining such status, may have been reluctance on the part of Africans due to white attitudes towards successful assimilados. For the former High Commissioner and Governor General of Angola Vicente Ferreira, the ‘so-called civilised Africans (…) are generally no more than grotesque imitations of white men’ . ‘It is a logical human step, even in Portuguese colonies, to proceed from laws which distinguish between native and non-native (…) to racial distinctions between black and white’. In South Africa a number of laws existed which formalised the social exclusion of non-whites. Although this was not the case in Portuguese Africa, Bender records that as of 1970 most Angolan natives lived in rural areas and had little contact with the white population . Penvenne reports that throughout the twentieth century, with the arrival of more and more white immigrants, less urban jobs became available to Africans in Lourenço Marques: ‘The depression crisis hastened the pace of racial exclusion, particularly in the better positions’ . In Angola the increasing numbers of white immigrants meant that by the mid-1950s ‘Positions usually reserved for blacks, such as waiters and taxi drivers, were nearly all occupied by whites’ . ‘Signs on the doors of Angolan restaurants reading “Right of Admission Reserved” are not accidental phenomena any more than are the creation of almost exclusively white towns and colonization projects in the interior’ . However, as Gerald Bender points out, these ideas have proved intensely resistent to any attempts to relate them to the actual reality of Portuguese colonization . Many Portuguese still now believe that their overseas explorations were essentially tame, well-meaning and mostly harmless when compared to those of other colonial powers. In the words of Claudia Castelo, the Estado Novo’s myths regarding the Portuguese attitude to race constitute both in Portugal and abroad ‘uma imagem relativemente duradoira’. Previous Post Care for a free f*cking newspaper? Next Post Why was Africa not a popular destination for emigrants from Portugal?